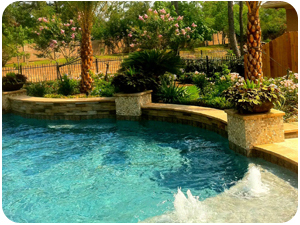 Since 1999, Envy Exteriors has been creating luxury outdoor living spaces in The Woodlands, Spring, Magnolia, Montgomery, Cypress, Houston, Conroe and Tomball, TX areas with custom landscaping, hardscaping and pool installation services. Since 1999, Envy Exteriors has been beautifying outdoor spaces in The Woodlands, TX areas with quality landscaping and hardscape services. We are a full service landscaping and hardscaping company. We can handle anything from landscape design to a full backyard renovation with a pool. In The Woodlands we can design just about anything to give your old pool a brand new look, and make it better than new. One of our remodeling specialists can take a look at your backyard, and create a one of kind design that can turn your pool into the stunning new masterpiece you’ve dreamed about. Improving your outdoor space is a necessity when you want to spend time outdoors enjoying the weather with those who are close to you, or you want to get that private area away from it all. Whether you are looking for outdoor kitchen, or any other landscape feature, we can be of service to you as the most expert and certified backyard kitchen design experts in the The Woodlands areas.